1069. It is necessary that there should be nothing between the forehead of the person offering prayers, & the thing on which he offers Sajdah. If the mohr (sajdagah) is so dirty that the forehead does not reach the mohr itself, the Sajdah is void. But if only the colour of mohr has changed, there is no harm. Q. Please, advise me the things on which it is allowed to perform Sajdah. b] Sajdah can be performed on things which grow from the earth, & serve as fodder for animals (e.g. grass, hay, etc.). c] Sajdah can be performed on flowers which are not edible & also on medical herbs which grows from the earth. But Sajdah on raw fruits is not permissible. d] Sajdah can be performed on limestone & gypsum, but the recommended precaution is that Sajdah should not be optionally performed on baked gypsum, lime, brick & baked earthenware, etc. f] Sajdah can be performed on paper, if it is manufactured from allowed sources like wood or grass, & also if it is made from cotton or flax. g] If a person does not possess anything on which it is allowed to perform Sajdah, or, even if he possesses such a thing, he cannot perform Sajdah on it due to severe heat or cold, he should perform Sajdah on asphalt or tar, & if that is not possible, on his dress or the back of his hand, or on any thing on which it is not permissible to perform Sajdah optionally. However, in such a situation, the recommended precaution is that as long as it is possible to perform Sajdah on his dress he should not do Sajdah on any other thing. h] The Sajdah performed on mud, & on soft clay on which one’s forehead cannot rest steadily, is void. i] If the Mohr sticks to the forehead in the first Sajdah, it should be removed from the forehead for the second Sajdah. Q1) Can i hold the sajdagah in my hand during salat? ANSWER: There is no problem in holding the turbat in your hand during salat. Q2) If, during salat,i loose the sajdagah, is it wajib for me to walk a few steps to get another one(when anything else is not present closeby)? ANSWER: If anything else is not reachable, then you should try to move/walk to the place which has the item on which sajdah is permissible PROVIDED you don't deviate from the direction of qibla and it is not so much away (i.e., it should not be such that an onlooker would say that this is person is not doing namaz). Q3) If, during salat, i loose the sajdagah; how many steps can i walk to get another one, without my salat becoming batil? ANSWER: As answered above, one should only walk not so much away. There is no specific measurement for that. Q4) Is it allowed to do sajda on a currency note, eg a $1 bill? ANSWER: Most currency notes have pictures and drawing on it; therefore, that would not be right. Q5) Is it alowed to do sajda on a colored paper when a) the paper is made from a material on which sajda is allowed? b) the color is not making a coating on the paper but has been added during the paper making process, thus the final product is colored? ANSWER: Doing sajdah on a coloured paper is not a problem. · There are 4 Ayat of the Quran that if one hears intentionally /recites any one of them, sajda becomes wajib. Sura Sajda 32:15, Sura Ha Mim Sajda 41:37, Sura Najm 53:62, & Sura Alaq 96:19. · Sajda must be done immediately. Purposely delaying the sajda is a sin & must be made up. · Method: keep the forehead on a proper place of sajda with the niyah of sajda for the sake of Allah. Not wajib to recite anything. Lift your head. There is no takbeer at the beginning, no tashahud, no Salam. · It is mustahab to recite any dhikr in sajda & Allahu Akbar on raising head from sajda. La ilaha illal lahu haqqan haqqa; La ilaha illal lahu imanan wa tasdiqa; la ilaha illal lahu 'ubudiyyatan wa riqqa; Sajadtu laka ya Rabbi ta'abbudan wa riqqa la mustankifan wa la mustak biran bal ana 'abdun zalilun za'ifun kha'ifun mustajir. · Only the forehead needs to be kept on a proper place of sajda. It is not wajib to keep the other 6 parts on the ground too. · The sajda must be done on a thing on which sajda is valid eg clay tablet etc. · For the sajda: Taharat (Wudhu/gusl) is not required, so a haez and mujnib also have to do the sajda as soon as they hear the ayah. · Facing the Qiblah is not required. · It is not wajib for a woman to cover herself as she does in salat. · Sajda is wajib only if one recites or hears intentionally. 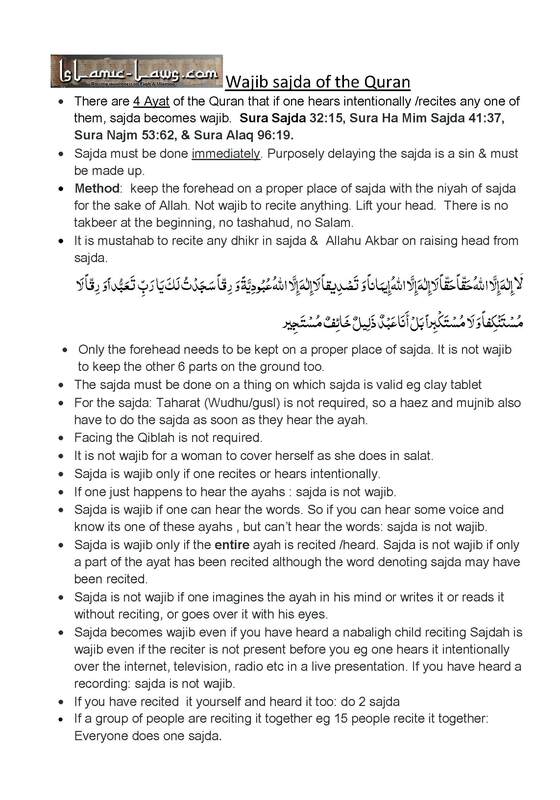 · If one just happens to hear the ayahs : sajda is not wajib. · Sajda is wajib if one can hear the words. So if you can hear some voice and know that one of these ayahs is being recited, but can’t hear the words: sajda is not wajib. · Sajda is wajib only if the entire ayah is recited /heard. Sajda is not wajib if only a part of the ayat has been recited although the word denoting sajda may have been recited. · Sajda is not wajib if one imagines the ayah in his mind or writes it or reads it without reciting, or goes over it with his eyes. · Sajda becomes wajib even if you have heard a nabaligh child reciting one of the ayat of wajib sajda if Quran. · Sajdah is wajib even if the reciter is not present before you eg one hears it intentionally over the internet, television, radio etc in a live presentation. If you have heard a recording: sajda is not wajib. · If a group of people are reciting it together eg 15 people recite it together: Everyone does one sajda.